Natchitoches Police Department responded to several calls in reference to multiple shots fired at Shop Rite, 247 Keyser Ave., Saturday, March 31 at 11:13 p.m. Upon arrival, officers came in contact with Jamel Haskett who had been shot multiple times. Haskett was transported by ambulance to Natchitoches Regional Medical Center where he later died. The Criminal Investigations Division of the Natchitoches Police Department began an investigation. Detectives learned a fight broke out between Haskett and Jaquarious Tyjuan Ardison, b/m, 21, of Campti. Both subjects then exchanged multiple gunshots resulting in Haskett’s death. A warrant for Ardison’s arrest was secured on the charge of First-Degree Murder. 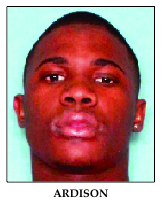 Ardison went into the Natchitoches Police Department and turned himself in Sunday, April 1 at 5 p.m. He was charged with first- degree murder and placed in the Natchitoches Parish Detention Center. Bond was set at $1 million. He remains incarcerated.